A new build private house in Kent, in a mature garden setting and with stunning views into a valley. 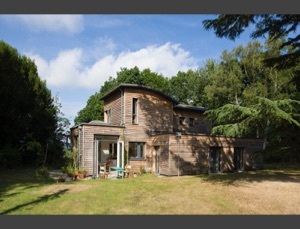 The house is highly airtight, insulated with sheepswool and triple glazed doors & windows, and is clad in oak. It is fitted with limed oak floors, underfloor heating powered by a heat pump and a high efficiency stove, and is kept fresh all year round with a ventilation & heat recovery system.